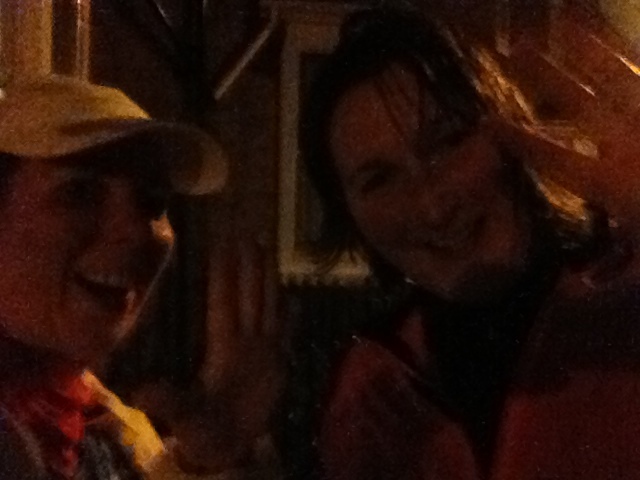 Operation shed 5 stone: I heart running again! Had you asked me 6 months ago if I could ever enjoy running again, I would have said never! Training for London Marathon destroyed me, don't get me wrong, an incredible experience and a day I will never forget, but I wasn't in the right physical condition and have suffered ever since with really painful shin splints, so running this past year hasn't been a pleasant experience! Also screwing up my 5k race back in November really knocked my confidence and belief in my own ability, so I just concentrated on gym work and ran once a week or so, mainly to keep in touch with my friends at running group. After Christmas I started helping out with Regency Runners 5k Learn to Run course, this fitted into my training schedule perfectly as on Thursday I was required to do some active recovery. I met a lady on week 1 of the course who I have come to know well over the last 10 weeks, I've never known anyone try so hard, and have so much spirit, she had her last treatment for cancer in November, and in January, she was out running. A leader, Anne, had approached her the Saturday before at Leamington parkrun after seeing her finish her first ever 5k in 54:36 and suggested she join the course. I have really enjoyed getting to know her over the last 10 weeks, she really is such an amazing lady, although I think there have been times where she has secretly wanted to punch me when I have pushed her on intervals or ran behind her up hills. This past Thursday was the last week of the 10 week course so the ladies completed the 5k race, and on a particularly hilly course she finished in 45 minutes, incredible! Regency Runners also run a 10k course alongside the Learn to Run, my friend Clair (@hulahair) gave herself a target for sub60 10k at New Year, and over the last few weeks she has worked really hard with the leaders to improve her running, she completed her 10k on Thursday in 60 minutes flat, I'm so proud of her! Also, last weekend was the first ever Warwick Half Marathon. I didn't run, for obvious reasons but so many of the ladies from Regency Runners were running, I love the group so much and we are really supportive of each other so if I am not running a race I like to go and show my support, which I did. 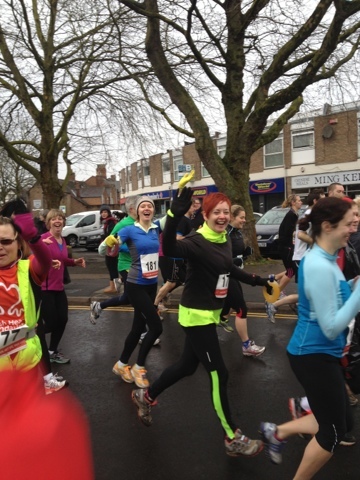 I really felt for the runners, it was such a miserable day but as they set off there were lots of smiles! There weren't so many smiles as they approached the finish line as 10 minutes after the start the heavens opened and it threw it down all morning. On a hilly route many of the ladies achieved PBs, and Tanya joined the sub2 club, ace!! It was on this day that I was reminded that I was running Regency 10k on 7th April, crap. I hadn't ran more than 4 miles since VLM2012, and those 4 miles were back in June! I thought I had better get training, and quick! Monday morning means the weekly email from Regency Runners outlining the weeks sessions. I had planned to run on Tuesday and was delighted when I saw that Tuesday was hills. I love hills. It's so hard but I know it's good for me, so I always try my hardest. Regency Runners really do this session well and it is really inclusive to runners of all abilities. Anne told me that she was going to work me hard after I was a teeny bit cheeky to her on twitter and geez she chased me up that hill so fast I passed everyone on the way up and when I got to the top I really thought my lungs were going to explode! She told me that it was excellent so I took the feedback and went back down to the bottom to go again, and again, and again, you get the picture! Friday was #5milefriday, which I had arranged with a few girls from Regency Runners with the Regency 10k fast approaching, I just wanted to know I had the miles in my legs, then I would stop panicking! At one point it looked as if I would be running on my own but then Sharon came up trumps so I was able to run with her, with a route I had never done before, which I prefer. It was a really nice chatty run, a bit of messing about with road works, closed pavements and mud during the first mile of so but after that we were able to run quite freely. Sharon said that she had noticed my running style had changed over the last year or so, I think this has a lot to do with losing such a lot of weight but also all the walking lunges that Oli has put in my programme! Apparently I'm much more upright and bouncy, picking my legs up much more, which is what I am working towards, great! Sharon asked me couple of times if the pace was ok for me, it was and felt quite comfortable and we were able to keep chatting as we ran, apart from the few hills where we concentrated not slowing the pace as we ran up them! The last mile or so was quite tough, all gradually uphill back to Sharons house, we had picked the pace up by this point too so I must admit to being pleased at seeing my car! We finished 5.2 miles in 58 minutes so not too bad. I was chuffed with the distance and I still felt that I had more in my legs so at least I know that I don't have to worry about the 10k in only 2 weeks time! !